All students must complete the online application to initiate the graduation review process. 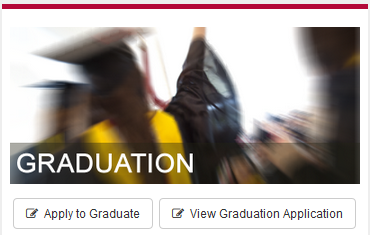 You must apply to graduate even if you do not plan on attending the Commencement ceremony. Please apply to graduate for the fall term if you anticipate satisfying your graduation requirements with intersession course work. 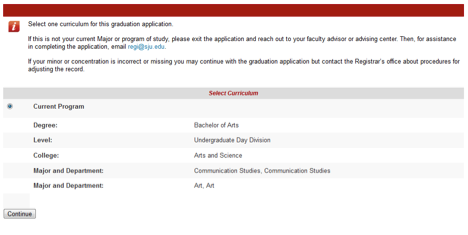 In the screen below, you need to select and confirm your curriculum information, including major, for your graduation application. If the information is not correct, please do not continue with your application; visit our Service Catalog to see how to make any changes. 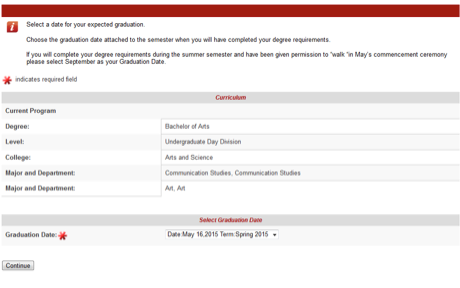 From the drop down list, select a date for your expected graduation. This would be when you anticipate satisfying your degree requirements. 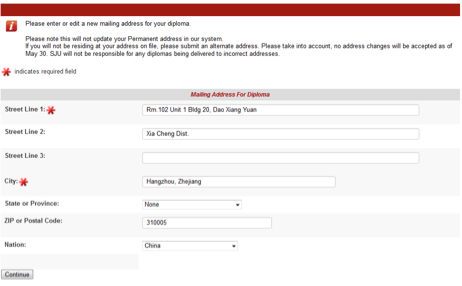 From the drop down list, select the mailing address for your diploma. This will not change your permanent address on file; this will only be used for mailing your diploma. Please take into consideration that your diploma is mailed 4-6 weeks after your degree is awarded. If you need to add a new mailing address not appearing on the above drop down list, please do so here. Please indicate if you plan on attending the Commencement ceremony in May. Enter your name exactly how you would like it to appear on your diploma. Your first and last name are not able to be edited here, but you can indicate if you want any of your middle name or suffix (IV, etc.) to appear on your diploma.